From the biopolitics of collecting in Ancient Mesopotamia, to the imperial philanthropy of Napoleon, to booty art in the Third Reich: when talking about the history of collecting and specifically the act of collecting in empires, the range of topics can be considered close to endless. 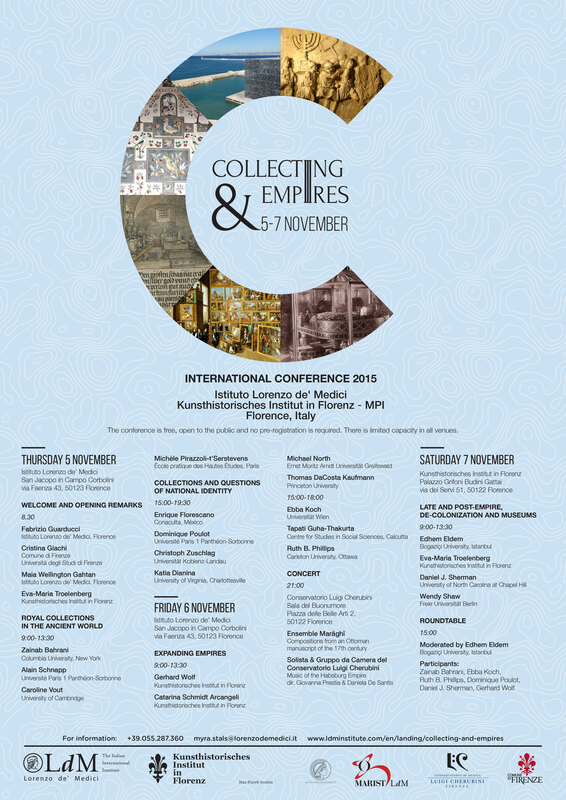 The Collecting and Empires conference, organized by the Istituto Lorenzo de’ Medici in collaboration with the Kunsthistorisches Institut Florenz, takes place from 5 – 7 November 2015 and features scholars and experts from all over the world. With a subtitle that seems to cover the entire globe, both geographically and chronologically, this international conference promises to be one of our most important events this academic year. To give the various seminars a musical tune, on Friday 6 November a concert has been scheduled at the Conservatorio Luigi Cherubini, including Ottoman Classical Music and music from the Habsburg Empire. The conference is open to the public, there is no fee and no registration is required.